The AC (Acromio-clavicular) joint is a thick fibrous joint that connects the top of the shoulder blade to the outer end of the collarbone. The joint is required to be strong and supportive and is the primary way in which weight bearing forces are transferred from the upper limb to the rest of the skeleton. The joint is connected by three strong ligaments, the Acromioclavicular, Corococlavicular and Corocoacromial ligaments. The primary mechanism that will cause this joint and it’s ligaments to be injured is a force that separates the shoulder away from the collarbone, usually in a downwards direction. This can occur from a fall into the ground where the top of the shoulder hits the ground first, a rugby tackle or a fall onto an outstretched hand. As with all injuries, there are many variations in severity. A grading system has been developed to classify AC joint injuries. 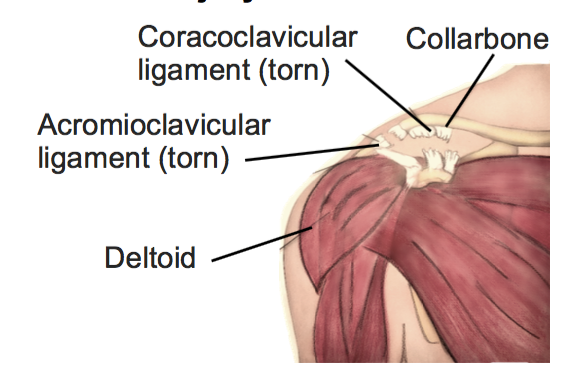 After an AC joint injury there is usually immediate pain on the top of the shoulder, swelling and bruising. There is often loss of movement of the shoulder, and pain from putting weight through the arm or carrying heavy objects. In severe cases there is a visible lump on top of the shoulder, known as a ‘step deformity’. This is an obvious difference in height between the top of the shoulder and the collar bone. There is frequently pain felt when reaching across the body, as when putting on a seatbelt. To confirm the diagnosis, your physiotherapist can perform some clinical tests and an X-ray can help to grade the severity of the injury. The classification that would be given to you by your physiotherapist or doctor help to determine the optimal course of action for each injury based in current research and available techniques. There are different classification systems, some use four grades and other six. Injuries with a smaller number of ligament fibres being torn are given a lower grade classification, going upwards as further damage is incurred. Injuries classified as higher grades will require surgical repair. The role of physiotherapy in this case is to ensure the joint is supported and given a chance to heal naturally, while maintaining the strength and normal movement of the shoulder girdle. This is done initially by providing support to the joint. You may need to have your arm supported in a sling or brace for some of this time. Your physiotherapist can show you some taping techniques to add support. Most AC joint sprains take six weeks to fully heal, although many patients report shoulder problems in future years. For this reason a comprehensive rehabilitation program is very important. More severe sprains are often treated with surgery to stabilise the joint and treat any possible fractures. Surgical repair will also require a proper rehabilitation program.